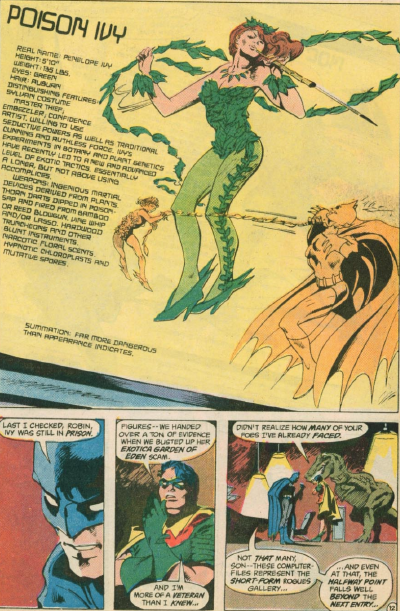 Detective 557 (Dec. 85) follows the big battle between Catwoman and Nocturna, in a story by Moench and Colan. 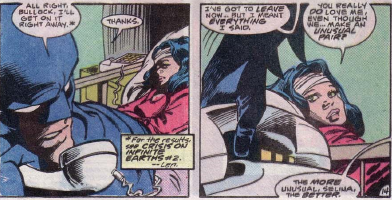 And though Nocturna and the Night Slayer are still on the loose, Batman spends this story sitting by Selina’s bedside in the hospital. 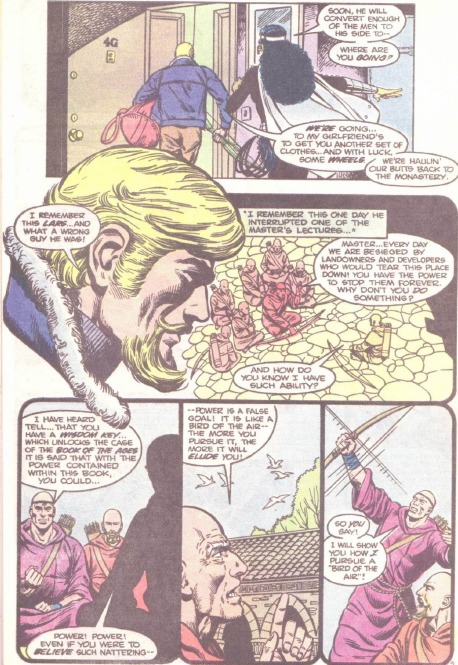 Robin returns to the cave, and in a slight allusion to the events of Crisis on Infinite Earths, the Justice League try to contact Batman. 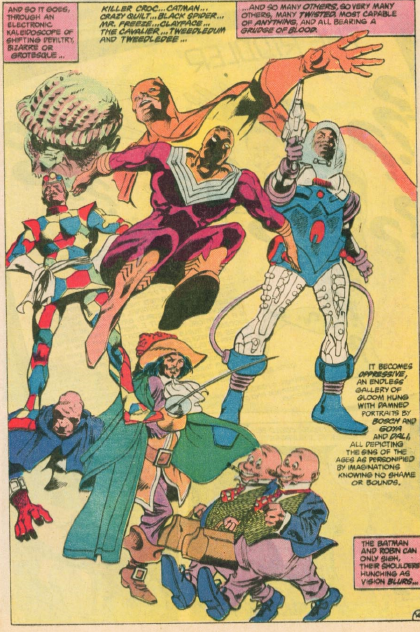 The Martian Manhunter, Elongated Man and Zatanna cameo. 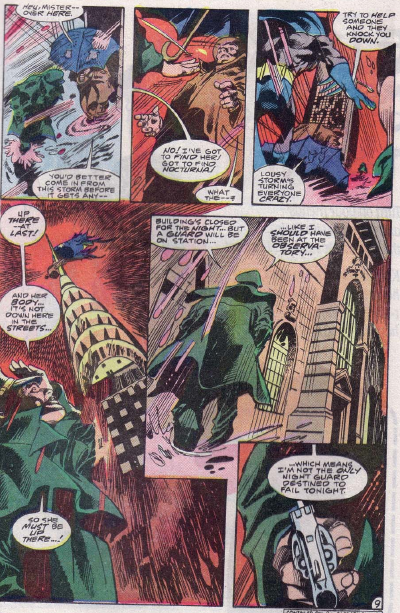 The Night Slayer is left pretty much free to keep killing the former members of Nocturna’s gang, and still aims to kill Nocturna herself. 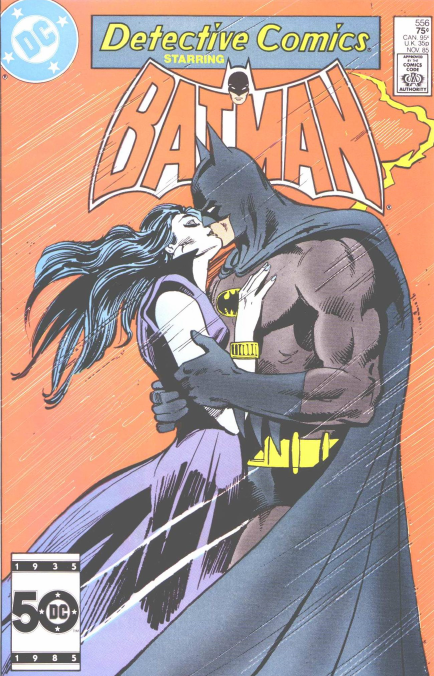 Batman and Catwoman are too busy professing their love for each other to care. 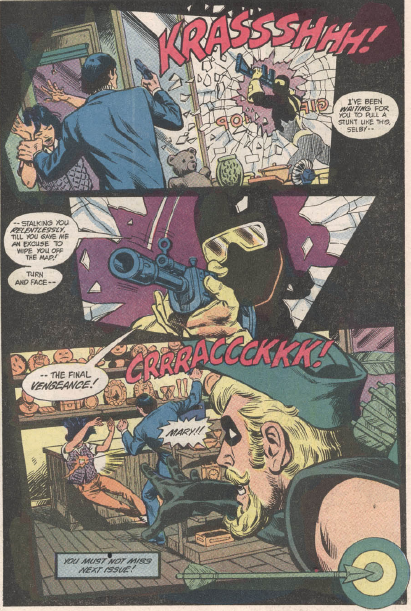 Cavalieri, Moore and Patterson conclude Green Arrow’s team-up with Onyx in this issue. Although I really love the art on this story, the tale itself just doesn’t warrant the length, to me. 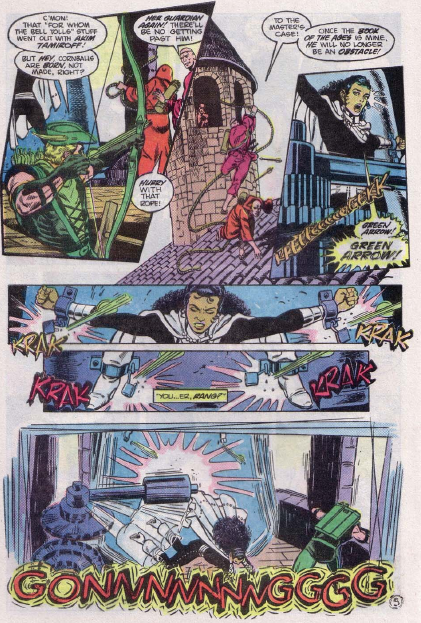 But there are great scenes along the way, as Arrow and Onyx defend the temple. 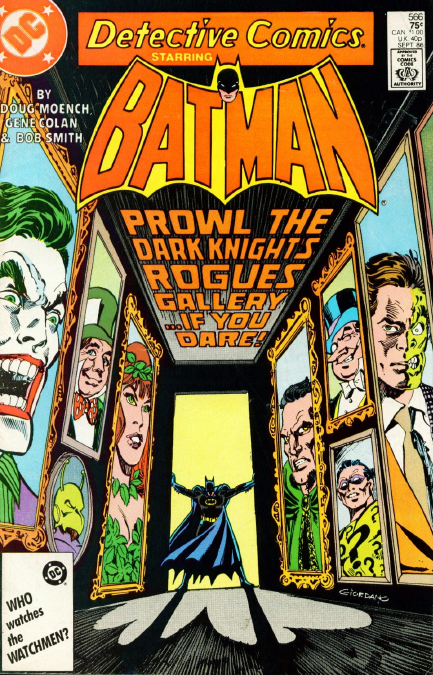 The cover for Detective 556 (Nov. 85) just incensed me when it came out. 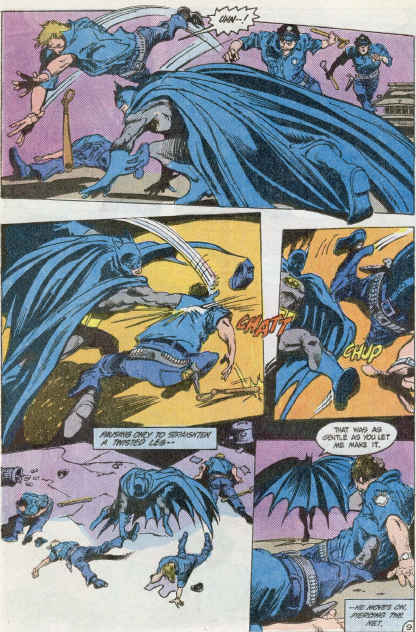 What was Batman doing killing Nocturna? 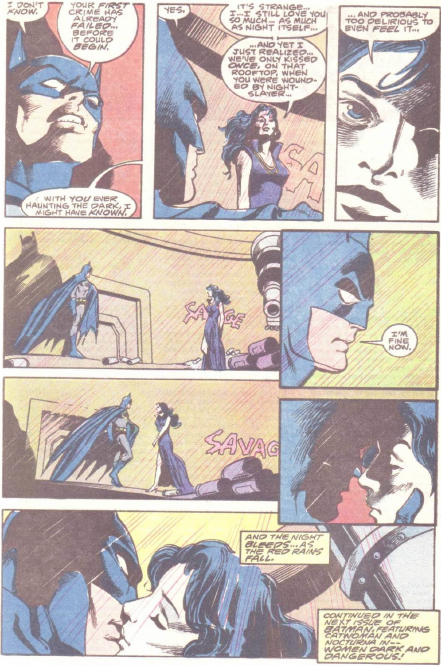 It’s Catwoman and Talia that he loves! 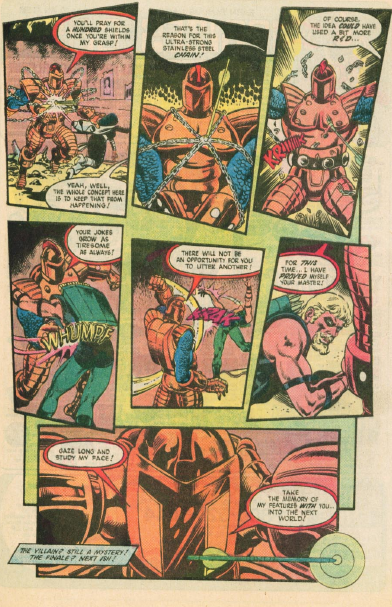 But the story, by Moench and Colan, did not anger me. 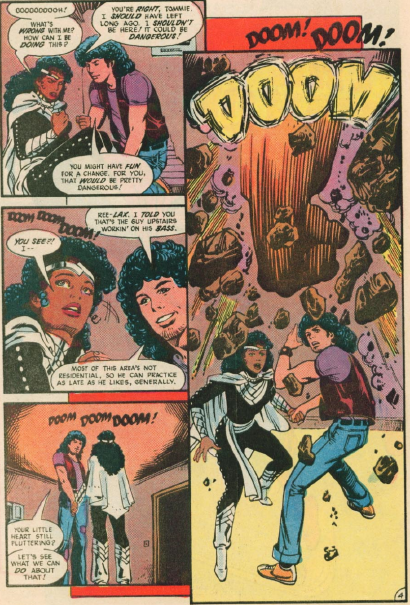 Rather, I was excited, for although the Crisis on Infinite Earths is not mentioned, the red rains that are falling clearly place this tale during that mini-series. 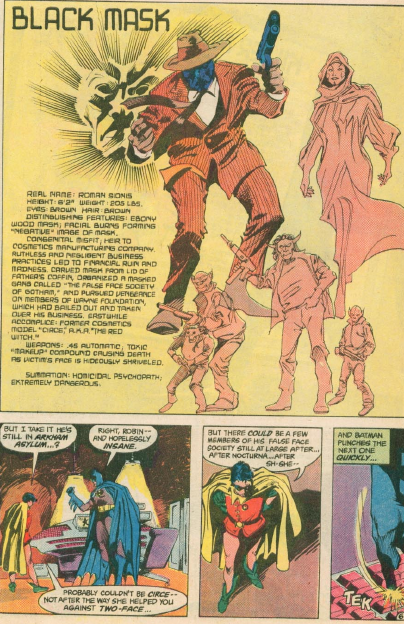 In fact, this and the next two issues of Detective must all take place during the first issue of Crisis. 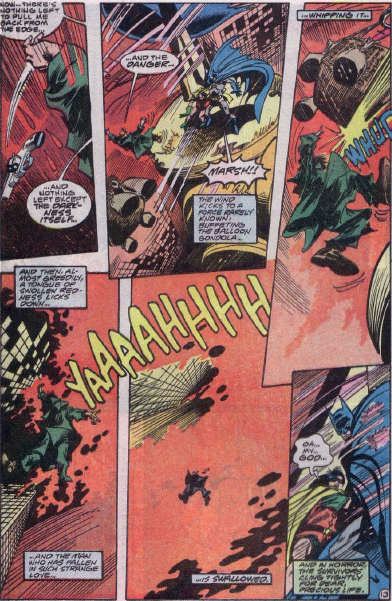 With Black Mask out of the way, but his men still around, Nocturna makes her play to become their new leader, and control Gotham’s criminal element. 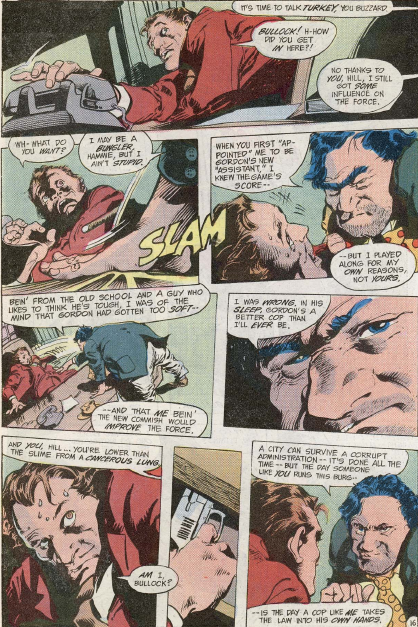 Bullock, meanwhile, shows he has the proper observational skills to be a cop, as he figures out that the current Robin is not the original one. 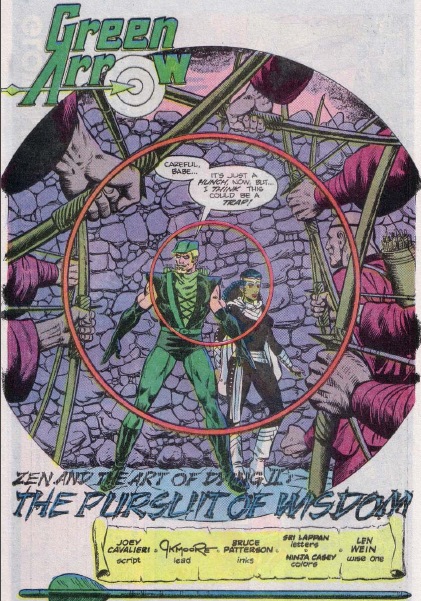 Although his guess at him being Nocturna’s son misses the bulls-eye. 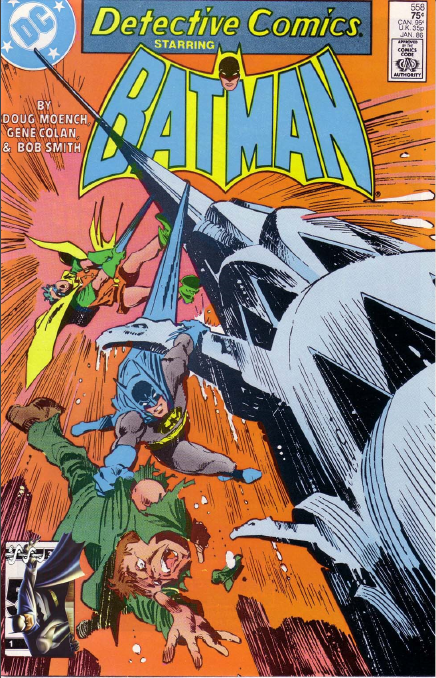 With Robin and the gangs under her spell, she concludes the story by going after Batman, and he doesn’t seem to have any resistance left. 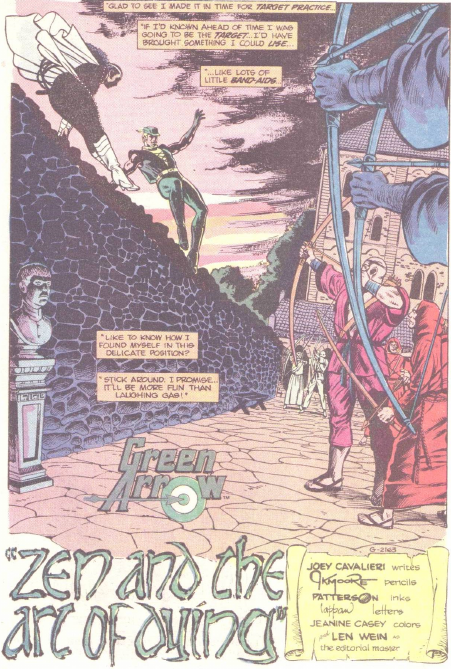 Green Arrow joins Onyx, as she brings him back to the retreat where she was trained, in this story by Joey Cavalieri, Jerome K Moore and Bruce Patterson. Onyx was a good character to introduce. A strong female, a capable fighter. 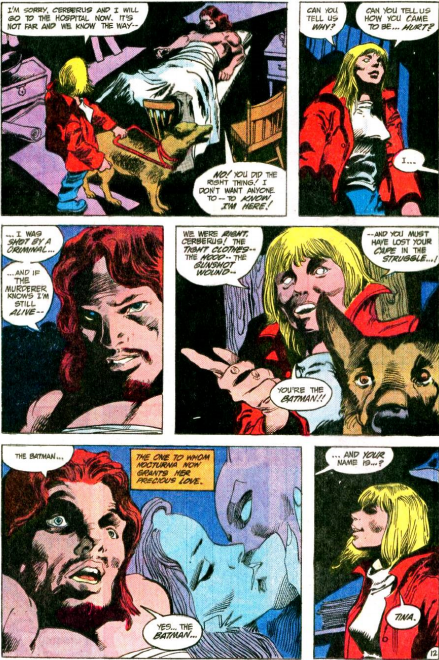 It just makes you wonder why Black Canary wasn’t treated as well in the same strip. It turns out Oliver knows the place well. It was the same place he went to after accidentally killing a child, a few years back. So technically, Connor Hawke could be in this story, if I can spot any young kids with mixed race skin and blond hair. 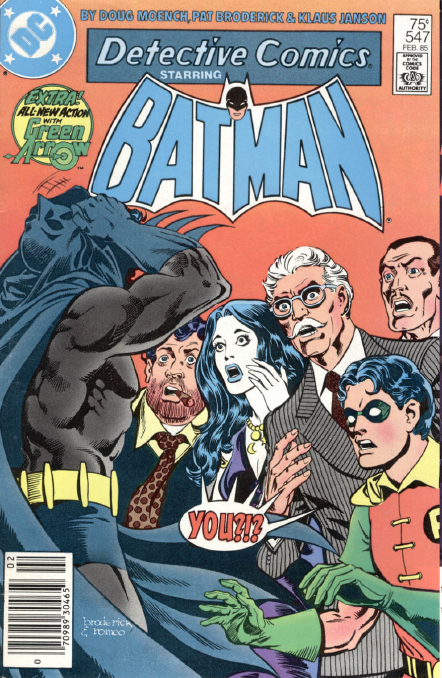 Ok, first off, nothing even remotely like the image on the cover occurs in Detective 547 (Feb. 85). 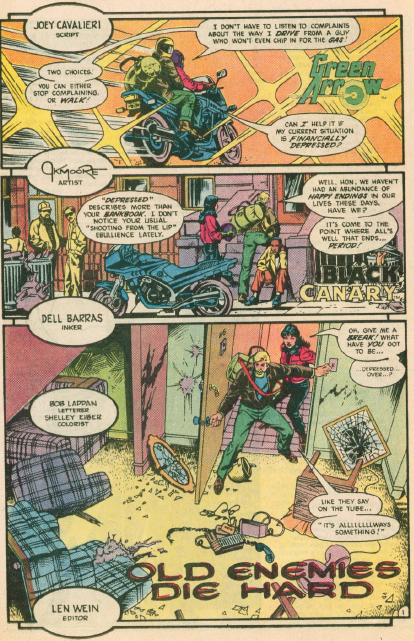 Doug Moench, Pat Broederick and Klaus Janson tell a story that is very much just another chapter in Batman’s soap opera life. 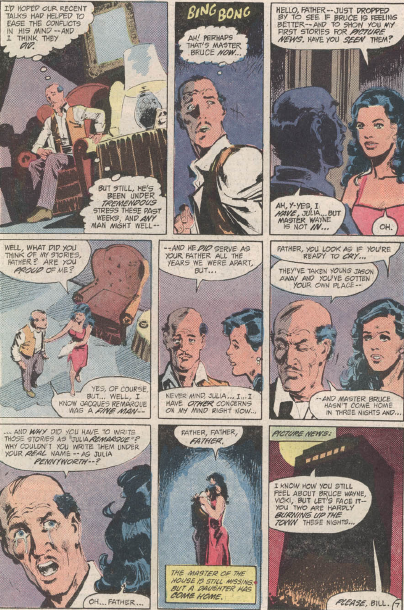 Julia has warmed up enough to Alfred now that she tells him she is changing her last name to Pennyworth. 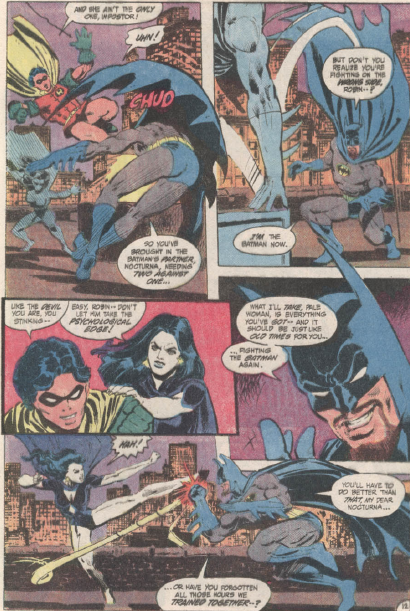 Nocturna and Robin are out on patrol together, and run into the Night Slayer, wearing Batman’s outfit. 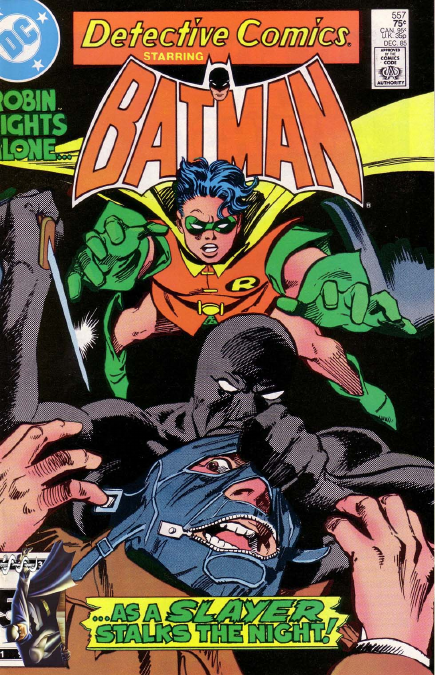 Batman is running around in the Night Slayer costume. 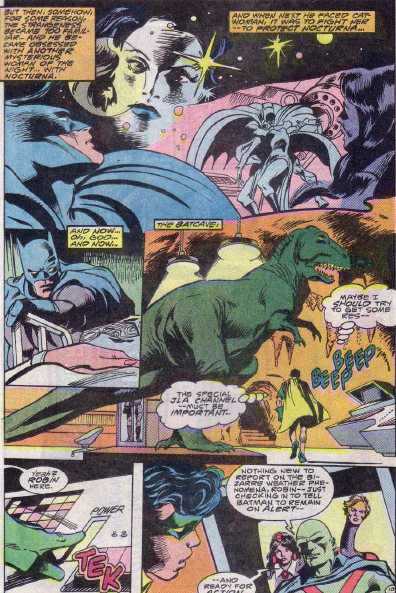 That all happened in the pages of Batman. 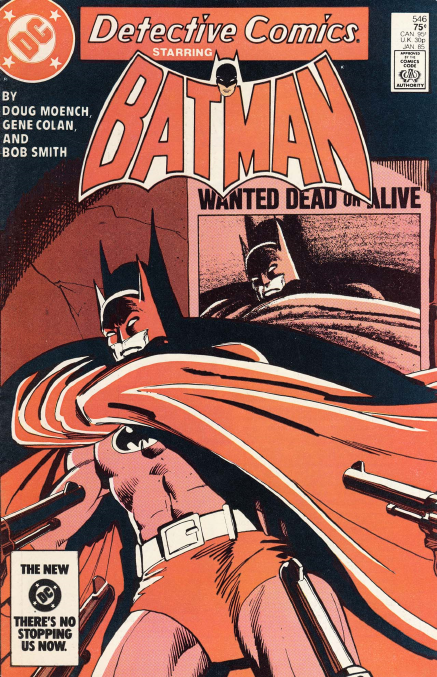 Overall, it seems that, during this period, most things begin, end, or happen, in the pages of Batman, as Detective stories carry the plot from one event to another. 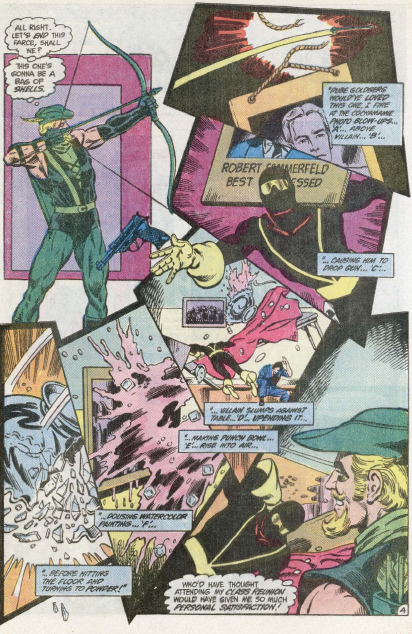 Cavalieri, Moore and Patterson continue their story about Vengeance, the man who looks and acts just like Vigilante, in this Green Arrow story. 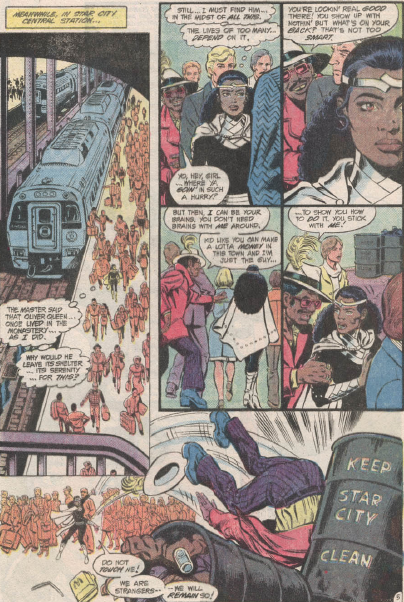 Onyx arrives in Star City, and shows herself capable of surviving the streets of the big city. The “crime” that Vengeance is out to avenge deals with events back from the VietNam War, and a messed up, guilt-ridden vet is the target. 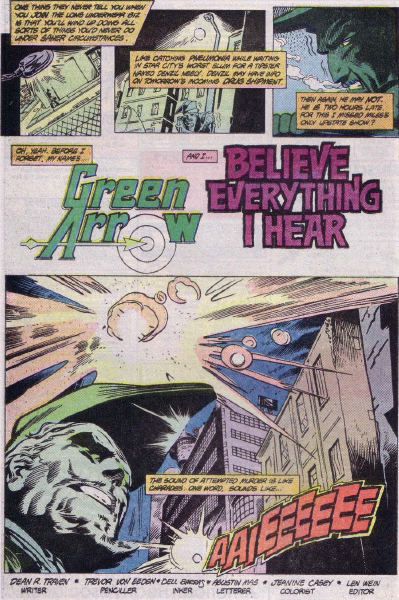 So we definitely side with Green Arrow. 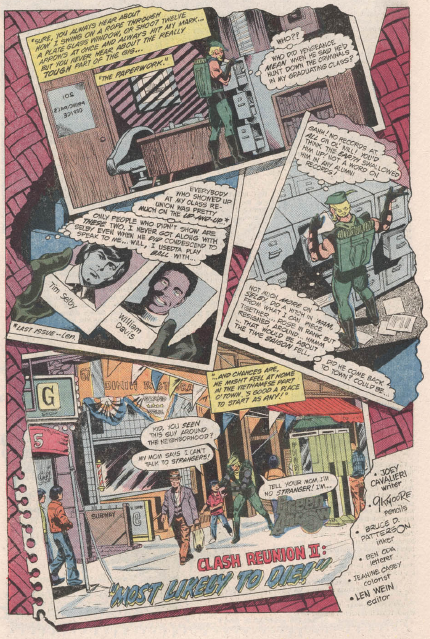 Things are spiraling downward quickly for Hamilton Hill in Detective 546 (Jan. 85), as Doug Moench and Gene Colan detail the mayor’s desperate actions. 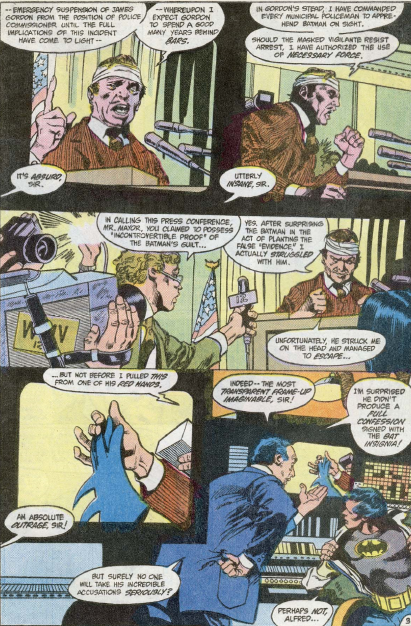 After a confrontation with Batman, and in danger of having his schemes exposed, Hamilton Hill calls a press conference to announce that Batman attacked him for no reason, and orders the police to arrest him. 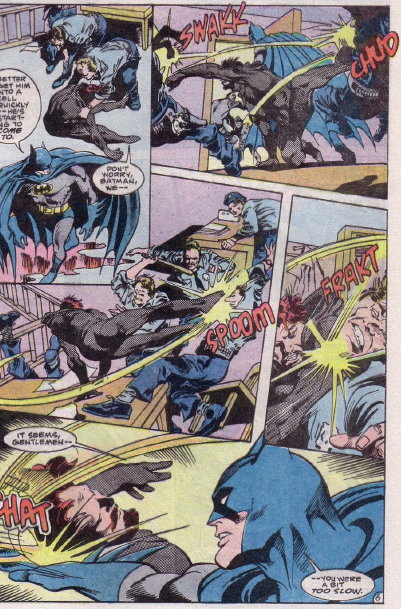 So Batman is once again forced to battle the police. He’s used to it, and good at it, but it’s never the ideal situation. 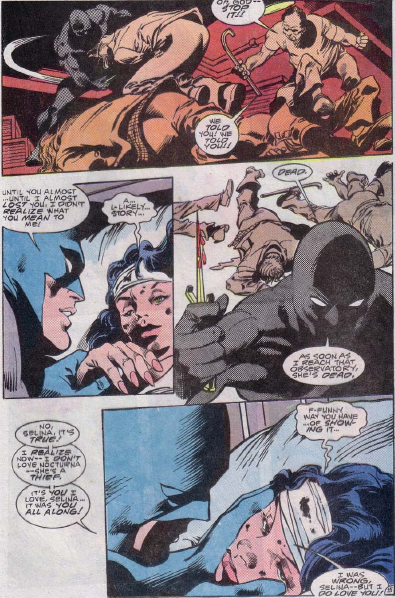 The Night Slayer continues to use the blind girl, Tina, who still thinks he is Batman. 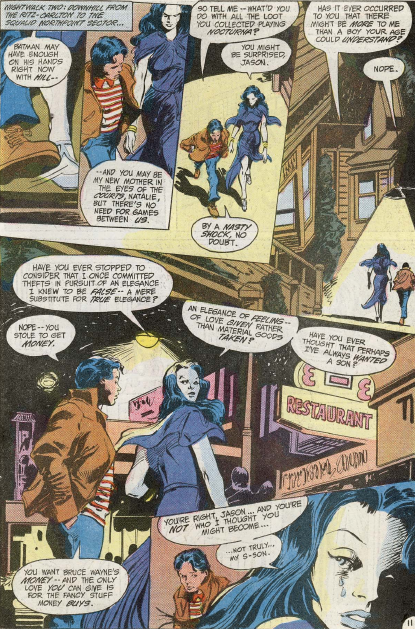 Nocturna takes Jason Todd out, and attempts to justify her life of getting men to steal for her, but her tortured reasoning does not impress the boy. Her guilt trips and tears are more effective. 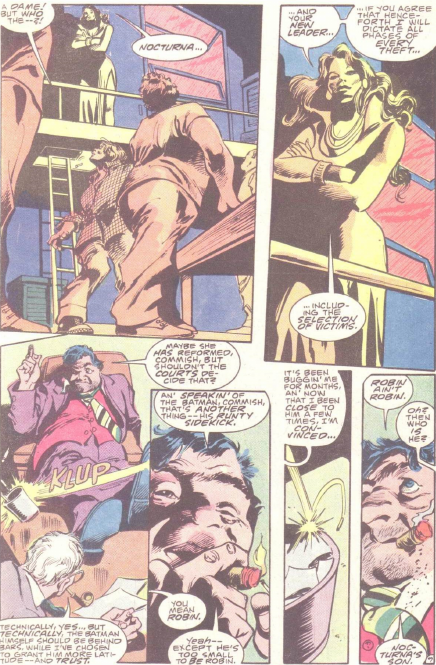 After another sniper takes a shot at Harvey Bullock, he goes to confront Mayor Hill on his games and lies. Hill pulls out a gun and shoots Bullock. 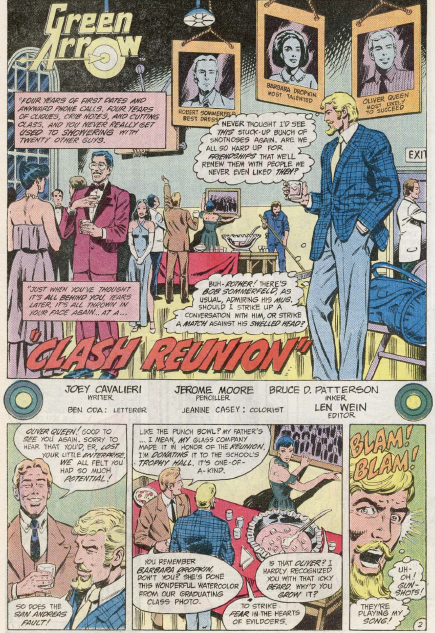 Jerome K Moore and Bruce Patterson join Joey Cavalieri on this tale, which sees Olive Queen attending a high school reunion. 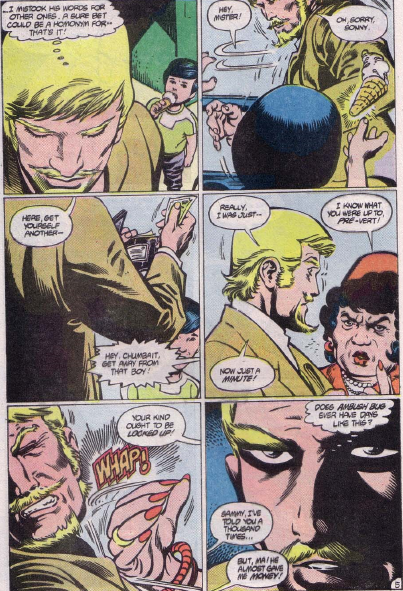 He feels very awkward and out of place until a vigilante bursts in, aiming to kill one of the alumni with criminal ties. 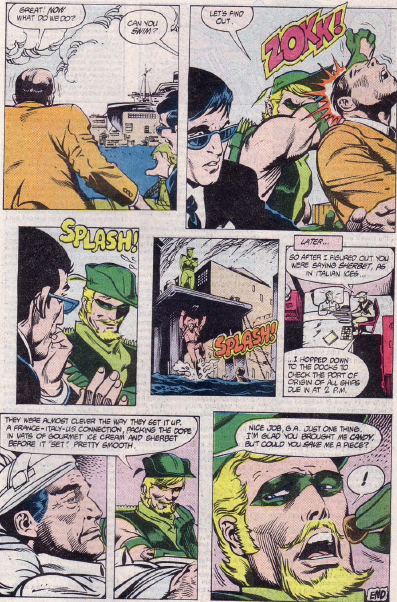 Oliver defeats him, but once cannot help but notice how very similar the character’s costume (and motivation) are to the recently introduced Vigilante, Adrian Chase. Be that as it may, the more important thing in the story is the final page, which introduces a young woman in a place of retreat. 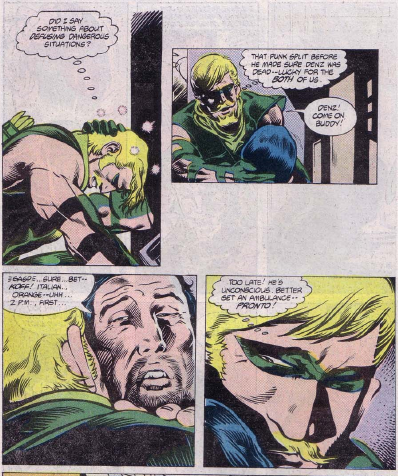 One of her mentors is dying, but before he does, he gives her the codename Onyx, and the mission to find Oliver Queen. 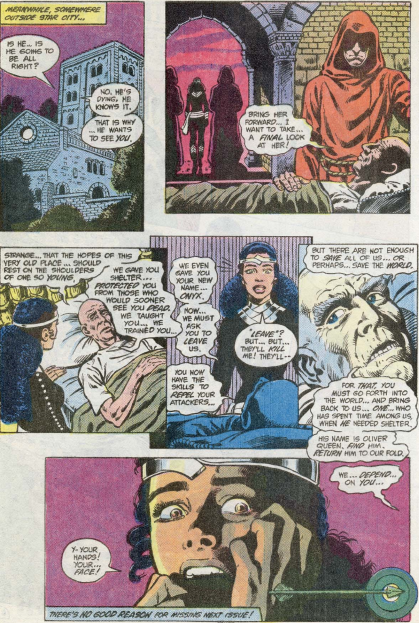 Doug Moench and Gene Colan are the creative team on Detective 545 (Dec. 84), a story which centres largely on the Night Slayer. 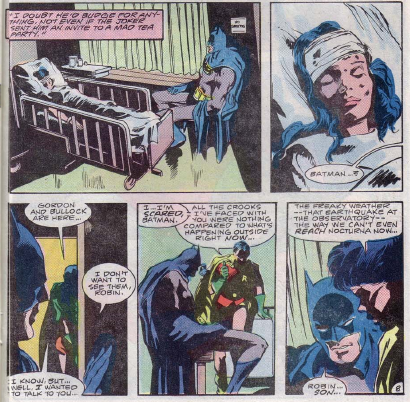 Anton Knight lies on a riverbank, wounded, and recalls his break up with Nocturna, and battle with Batman that left him injured and exhausted, near death. 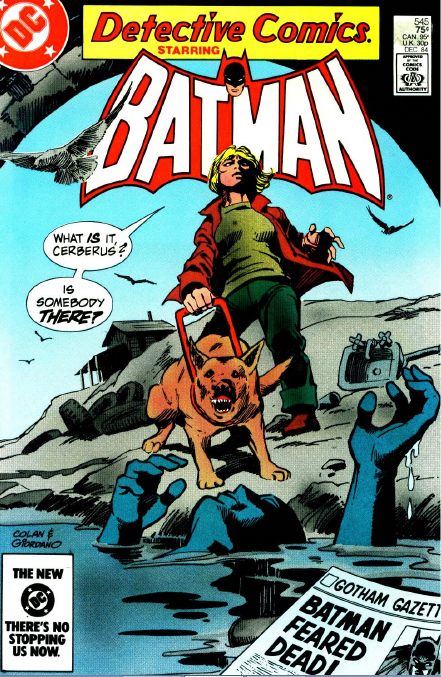 He gets rescued and tended to by a blind woman, Tina, who believes that he is Batman. He decides to go along with the lie. 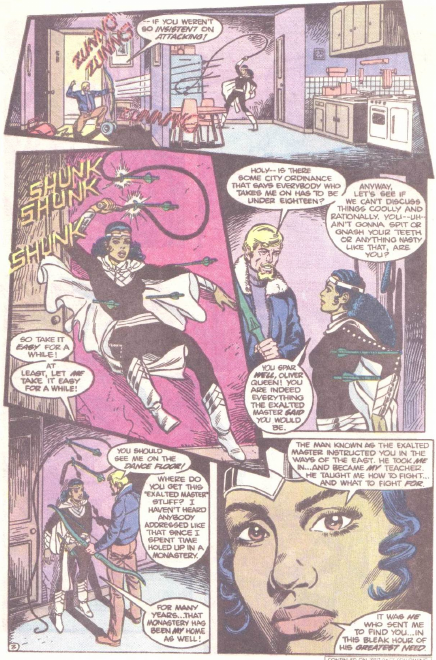 And that’s really about all that happens in this one, although much of it gives us Anton Knight’s perspective on his relationship with Nocturna, and the obsessive love she engenders.